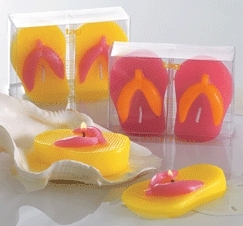 These flip flop candles are perfect for your beach themed wedding or a pool party! These floating flip flop candles resemble and old time favorite, flip flops. The flip flop candles are sold in pairs, left and right shoe. They come in several different colors, fushia, yellow and striped. They are packaged in a clear box. Perfect for gift giving or beach wedding favors. You can mix colors and flip flop candle styles to meet minimum price breaks. 1"H x 3-1/4"L x 1-1/4"W.
In Stock. Quick Ship. The prices are listed in the quantity prices drop down box. Make sure to look in the Favors - Flip Flop section for more great flip flop favors.